Check out our videos! More to come in the future, so check back often. 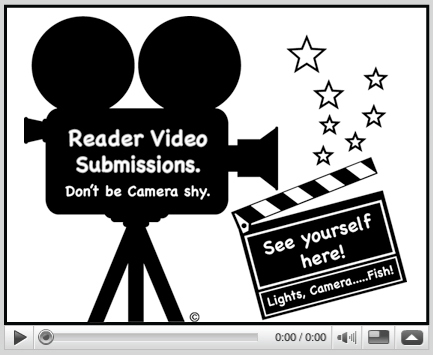 Send us your video/html code and be part of this Fish TV video Page. With the new Quabbin Reservoir fishing season opening up this Saturday on April 14, 2012, in the spirit and excitement of the new season approaching I have uploaded this video, containing some of the highlights caught on film during last years 2011 (spring) season. Quabbin Reservoir anglers are usually pretty much divided into two categories of fishermen, the trout/salmon guys & the smallmouth/largemouth bass guys. Personally I love them all, so in this video are clips of both lake trout and smallmouth bass This video shows some lunker smallmouth, a couple of buddies on my boat catching their very first smallies and interesting enough a lake trout trying to bite my neck. I still have a bunch of content from last year to edit and put together and figured I better catch up a bit and in doing so have started with this very video. As usual I'll be bringing my camera on this seasons fishing excursions and looking into new editing software and new ideas for improvements to new upcoming 2012 season videos to be shot. TIGHT LINES! 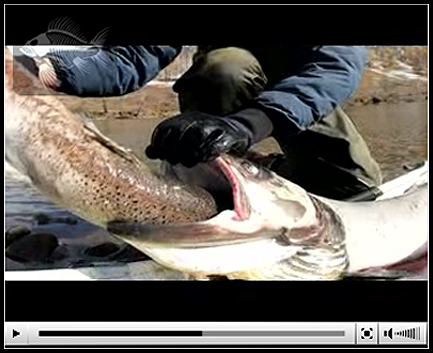 This video captures some highlights of the 2011 ice-fishing season. With such heavy snowfall not seen in many years it was pretty horrific going out and dredging through all the thick snow. Not to mention a slower season it seemed in terms of action but me and some friends were still able to get out and brave the elements. Highlights included: The Great Meredith Rotary Derby in NH and some Chain Pickerel, Rainbow Trout, Largemouth Bass, Broodstock Atlantic Salmon and Yellow Perch action in MA. Trying to finish off editing and uploading the rest of last years fishing clips (a little behind) before uploading any of the most current fishing clips filmed recently during early spring 2011 open water season. Please subscribe and look for more videos to come. This video shows some highlights of an afternoon spent with my wife fishing for rainbow trout. It was a very welcomed hot day in May, with blue bird skies and a hot trout bite. We lost count of how many trout we both caught and I had a blast watching my wife enjoy herself so much, reeling in one right after another (good times). Can't wait for the snow and ice to melt and the 2011 open water season to get under way. Tight Lines! This is an old video I made over 2 years ago that I never uploaded showing some of my past pet Peacock Bass (Type: Butterfly/Cichla Ocellaris) feeding and attacking prey. Though I wasn't going to add it since this is primarily a fishing website I decided to do so anyway incase anyone might be interested in viewing it. Some clips from 4 fishing trips I made over the summer for Fallfish. I wanted to explore some local creeks and rivers in hopes of finding Fallfish. The point of this was not only for some tugs on the line by a some what new species for me but also to try and find sources of some jumbo size bait, beyond what any of the local bait shops could provide. Fallfish make great (and legal) bait for hunting large predatory fish. I started first by fishing a river a short walk from behind my home (one that I overlooked for too long) and realized I didn't have to go far to find a great fallfish fishery. Later on other spots where found as well. Even if you have no interest in them as bait they are still worth targeting. Especially on an ultra-light rod, the action is consistent and though these fish are not generally large pound for pound their scrappy fighters. Looking for something different give them a shot. Click play button above to view. Fishing for Brown Trout in Massachusetts. Some highlights captured of a few trips, during the 2010 open water season. The brown trout in this video are hatchery fish, stocked by the Massachusetts Division of Fisheries and Wildlife (MassWildlife). Click play button above to view. A collage of multi-species fishing and wildlife clips shot over the Summer of 2010. Click play button above to view. This video is a bit of a spoof on shows like river monsters and my own self but all the fishing was actually real and nothing was staged nor was it shot in someone's backyard ornamental pond. Over the summer a couple of friends of mine told me about a drainage pond out by a local wooded area that contained only Golden Shiners, Rosy Red (Fathead) Minnows and Goldfish. Rumor has it the pond was stocked by someone 6 years ago and the fish took to it and since have bred and now thrive. I was curious about how big the goldfish and shiners grew. So one weekend I decided to check it out with some friends. It was some not so serious fishing and a little goofy but still fun. This is also a YouTube experiment to see what kind of ratings such a silly video will get. But with all kidding aside the goal was to catch some feeder fish for my aquarium pets at home and to bring back a couple of large goldfish to add to my fish tank (which we accomplished). Besides how many people can say they caught their own pet goldfish. Truly one of my most wackiest fishing excursions ever. Click and watch this video to see how it went. My wife and I took a road trip to Maine hoping for 3 days of some lakeside end of summer fun in the sun. However cooler temperatures rolled in along with some heavy wind and rain. Which prevented us from pursuing other water activities, like swimming and the beach. It was even cold enough that we had to load the fireplace with wood to keep the cabin warm at night. Not what we had in mind but that's mother nature but we made the best of it and still managed to have a great time. We ate well, relaxed and of course fished. We stayed at Bald Mountain Camps Resort on Lake Mooselookmeguntic, which sports native and self-sustaining populations of wild brook trout as well as landlocked salmon. In addition we also caught some yellow perch and fallfish. The lake also has a public boat launch and a near by sporting goods shop. There are also fishing guides in the area however we chose to self-guide ourselves. The scenery is very beautiful. The fishing was a little rough at first but we were able to figure them out before ending our trip. This home movie/fishing video shows some of the highlights we were able to capture on our camera. This video contains some Largemouth bass highlights of my 2010 season. Pursuing a variety of other species I didn't get around to doing very many largemouth bass trips but I still managed to get into some decent bass. My favorite highlight was taking my little nephew out on his first fishing trip and putting him on his fist largemouth bass. Catching my first Koi fish. Also some more common carp Bill and I caught. This video is a short documentary of Bill and me attempting to try and catch our first trophy size carp. The mission for both of us was to try to attain our first MA Sport Fishing Award Pin for this species. The minimum weight needed to do so is 15 pounds. We were not all that experienced with carp fishing. Here's how it went. In this video are some of the Landlocked Salmon that friends and me targeted and caught back in the spring (May 2010), at the very beautiful Quabbin Reservoir. Where the loon's call and the eagles soar. Like last year most of the salmon caught were of quality size and this year proved to be no different. Highlights in the video include four Massachusetts state award pin fish, a friend who I helped catch his first landlocked salmon, two freak salmon, which include a male with crooked kype, that extends to far right and a hen with a compressed looking head (probably not wild born fish and the product of a hatchery smolt stocking). And my best landlocked salmon of the spring season, a 6-pound whopper. This video contains some of the Smallmouth Bass caught this past 2010 spring at the Quabbin Reservoir in Massachusetts. All fish in this video were released to fight another day. Last spring was good but this year was even better. Allot of big bronze backs were caught this year ranging between 4 lbs - 4 lbs 7 ozs and of course some smaller ones too. The smallie's in this video were pre-spawn fish, caught on shiners, jerk baits and jigs. Most of the large and fat bronze backs were big females loaded with eggs and smelt. Also I managed to get some under water footage of some of the releases as well. I could not get over how hard these football shaped smallmouth fight and look forward to perusing them again. Over the spring I took a little time to target Massachusetts most hard fighting trout, the Tiger Trout. Pound for pound their aggression, vigor and fighting ability surpasses all other trout. The video contains a compilation of clips of some of the Tigers I pulled out thus far this season. The Tiger Trout is a sterile hybrid trout produced by fertilizing female brown trout eggs with male brook trout sperm. Because their a hybrid many trout snobs dub them as Franken fish or some man made lab fish that should be discontinued. However to argue this point these fish can occasionally occur in the wild, in areas with breeding populations of brown and brook trout that both share the same waters. These occurrences are extremely rare but do happen. Most tiger trout (as the ones in this video) are hatchery bred and stocked by the division of fisheries and wildlife and are a product of the Sandwich State Fish Hatchery and stocked annually. This year I wanted to target a new species within my home state of Massachusetts and that species is the Lake Trout. Though I have caught them in other states I wanted to catch some on home water. To me there is just something more gratifying about being successful within you own backyard and doing it all yourself, versus traveling and hiring a guide or charter service. The Quabbin Reservoir is only one of two lakes within the state that have a lake trout fishery and the only one that allows anglers to fish out of boats. The only other recognized lake trout fishery within the state is Wachusett Reservoir, which only allows shore fishing. Last year I targeted landlocked salmon and smallmouth bass at the Quabbin and since I was already a little familiar with that lake and prefer fishing out of a boat naturally I chose it for my lake trout hunt. Last year I never even caught an incidental Laker. So this year it became a goal. This video shows some of the Lakers I caught earlier in the spring, including my first MA Laker. It also shows a couple of friends who I helped put on their first MA Lake Trout as well. The lake trout are wild and are bigger than your average hatchery reared trout and are another great game fish option. A small collage of clips of some of the solo catches I made in March. Which include a 9 lb 3 oz Broodstock Atlantic salmon, Brown Trout and Rainbow Trout. All fish caught on lures (no live, dead or dough bait). Also some interesting footage of a beaver I captured, you just never know what you will come across while spending time outdoors. This is just my start to the new open water season. This season Im hopeful and confident that it will be a fruitful one. I also hope to pursue many other species and also look to improve the quality of videos made here. So please SUBSCRIBE, stay tuned and track my progress. Also if you happen to share the same passion and have your own fishing channel or website let me know about it and Ill check it out. THANKS! Carp angler and reader Jerome Moisand, sent us this interesting video. Incredible under water close up footage. We received a trailer of AEG MEDIA's latest film. Below is only a still shot, however to view the full trailer, go to the reviews page on this site. Also on that page look for a review of this film.